Have you ever wanted to create the illusion of being able to cement a thought into the mind of your spectator 100% of the time even if she has the ability to freely choose ANY thought...yes, literally any thought? 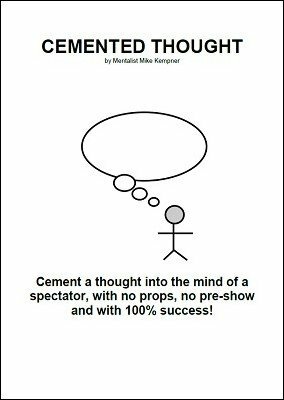 Welcome to Cemented Thought , an underutilized and somewhat lost principle that will enable you to do exactly this. You tell your spectator that she is to think of any word only in her mind. She will not write this down, as it is completely mental...and there is no process at all. She simply thinks of any word...no force at all. You tell her, "the thought is now cemented in your mind". At the count of three, she is to say the word out loud for the first time. You direct her to move her feet, as literally under her feet will be the very word she just thought of...written on the ground. Welcome to Cemented Thought . I'm sorry, but this is a bad review. I think this is just an idea that after reading, I don't think I would ever perform. Besides, to be effective, the thought of word would probably need to be a very short word, so I don't think it falls under the category of "ANY thought". The ground would also need to be flat and of the cement kind, and the word is seen written, not cemented.